Through the years, I have found myself to be one who doesn’t ask for help, no matter what. Case in point: I once had a solo death-defying act of hanging a ceiling fan at a height where objects below looked like toys, using a ladder that should have been outlawed, all the while causing my wife to go out on the back porch and pray out loud until I finished. That probably comes in No. 1 on my list of stupefying stupid stuff I have done. But I’m a man, and we just seem to do things like this, allowing our wives to understand why Eve gave Adam that first piece of fruit – because it was so easy to do. Over the years, I have slowed down on some of the exciting things and now take the advice that Andy gave Aunt Bee about getting the deep freeze repaired: “Call the man!” Guess I have seen too many folks my age on TV lately falling without their emergency button around their neck. There are still a lot of things one person can do alone, but there are just some things that take more than one. Folding a fitted sheet may work for some people, but mine just comes out in a wad of fabric. It takes two people to check real good for ticks, no matter how you do it. There is no way in the world to turn a mirror and get tweezers to work properly on the human body at the same time. That’s a fact, and we just have to live with it. If you can make it work with ease, then you may have bigger concerns than ticks. 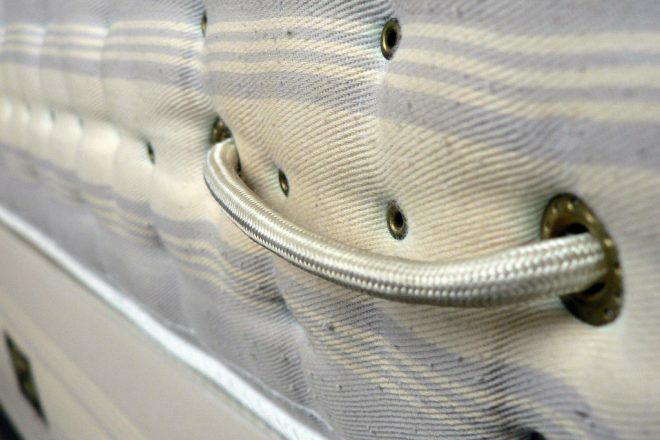 Another household chore that requires two people is the occasional turning of the mattress. Located in my chambers (don’t that sound majestic?) is a fairly new queen-size mattress that almost requires a ladder to get into the bed each night. When I bought it, I was given instructions to turn it regularly to keep from voiding the warranty. Turning meant to move the head to the foot in a circular motion. That may sound easy if your bedroom was the size of a gymnasium and your bed was flat with no posts, but neither of those descriptions fit my bedroom or bed. The mattress also has the weight of a steamer trunk and is not real easy to grab ahold of. Following a period of waiting too long to make the turn, with the mattress developing an image of me in the very center, I decided I would take it upon myself one Saturday morning to follow the directions and turn the mattress. Today, I can tell you, I should have “called the man” or at least someone with a good back, but instead, on that cloudy day I once again did it my way (I think someone else who said that is no longer with us, hmm). After clearing everything off of it and standing at the ready, I grabbed one side of the mattress to slide it around. The next thing I knew I was face down with a mouth full of pillow top and two feet sticking straight up in the air. The mattress had not moved. Not to be outdone by a sack of cotton, I slid both arms under one side and lifted with all my might. This time it moved sideways, knocking pictures to the floor from the nightstand and pinning me against the wall. With nothing else to do but lift it up, I got one leg under the monster, pushing it upward until now it rested like a plate on a juggler’s stick on one of the bedposts. As it hung unbalanced, I was able to free myself. I made a mighty leap, knocking it into a spin, and like a miracle, it fell into place on the box springs in the proper position. I only lost a couple of family pictures and the telephone in the process. That morning, after putting the fitted sheet back on and making the bed, I proceeded to recover from the hardest wrestling match I had ever had with a bedroom item. In the future when the thing needs to be turned, I may just order a new mattress.